Filed to: Ka-zaam!Filed to: Ka-zaam! Man-mountain Shaquille O'Neal is a famed Twitterer, but his love of gadgetry goes even deeper than that. A follower of Shaq's Twitter met him at a diner and exchanged a little gadget trash talk. 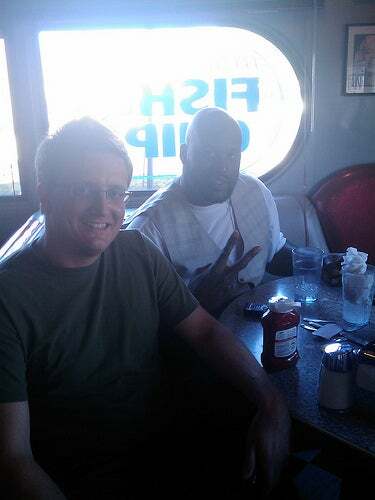 After seeing an update on THE REAL SHAQ Twitter that he was at a nearby diner, blogger Jesse Bearden hopped on over and met the big guy. Turns out Shaq is a real gadget guy (you think he's reading this right now? HEY SHAQ! HEY! ), and he was eager to show off his T-Mobile G1 and poke a little fun at Jesse's WinMo phone. "He ordered like 20 dollars worth of food," the kid stammered out, obviously thrilled to be talking about it. "And he left me a 160 dollar tip. Then he asked for a Sprite and gave me forty bucks for it."